EconomicPolicyJournal.com: "It’s Surreal. We’re In The Matrix"
"It’s Surreal. We’re In The Matrix"
Only nine of 517 retail spaces in the New Horizon Mall have opened for business since owners were allowed to take possession in May, said Eli Swirsky, president of The Torgan Group of Toronto, reports The Canadian Press. The planned late-October grand opening has been postponed until sometime next year. “It’s surreal. It’s not normal — we’re in the Matrix,” said shopper Pat Williams, who wandered the mall’s echoing hallways taking pictures on Thursday. 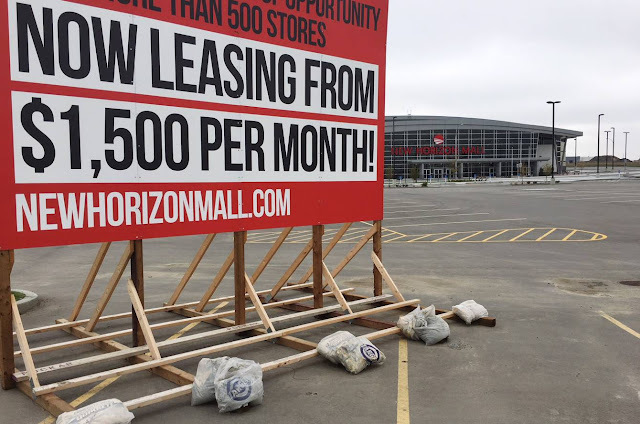 Unlike most shopping centres in Canada, about 70 per cent of New Horizon Mall’s retail space has been sold to individual investors who have the option of leasing to others or operating the space themselves. The rest of the space is being held by the developer for large anchor tenants. The difficulty in filling the mall is likely mainly due to its condo ownership model, which tends to attract investors who may not know much about the market rather than owner-operators, said retail analyst Maureen Atkinson, a senior partner at J.C. Williams Group. “The challenge with the condo model is that the people who run the stores are typically not the people who own them,” she said.